Beneath the rippled current of a trout stream, a complex food web plays out far greater than many anglers realize. The basic biology of a trout stream is often hidden well out of our view unless we are willing to explore the depths, which often requires getting wet and cold. At the very bottom of a fluvial food chain is a bio-film - powered by sunlight and dissolved nutrients - that covers the rocks, plants and woody debris upon which benthic macro invertebrates feed. Slightly higher up the taxonomic ladder are the benthic macro invertebrates, underwater organisms which lack backbones. Macro invertebrates such as insects, worms, crustaceans and isopods feed on the bio-film, then become food for other insects, birds, small fish, and ultimately, the trout we love to pursue as a favorite game fish. The Gold Ribbed Hares Ear meets a Kaufmann's Stone. Taxonomists have divided the entire known biological world into eight categories from domain, kingdom, all the way down to genus and species. For a fly angler wanting to choose the right fly, it is important to know at least the family orders of the three primary aquatic insects. A familiarity with the three dominant taxonomic families is a must when choosing the right fly, as each family has its own distinct shape and life cycle. 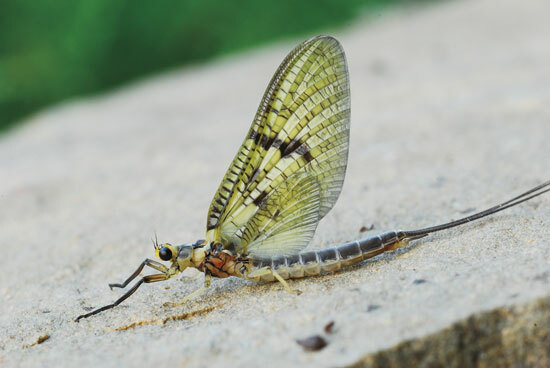 The three families of aquatic insect that we must pay close attention to are: Ephemeroptera, Plecoptera and Trichoptera, otherwise known as the Mayflies, Caddisflies and Stoneflies (EPT). Each of these families of insect has its own unique life history and key role within an aquatic food system. Each EPT family category is not hard to recognize throughout the individual life stage. Mayfly adults have a distinct pair of upright wings with a variety of three tailed larva known as nymphs. Caddis adults have tent shaped wings, with the larva stage having tubular, worm shaped bodies, and often, external shelters they build and carry around with them. Stonefly adults have two pair of wings that fold flat over the back, and the larval form are often large and robust crawling about the rocks. Keeping a simple collection of fly patterns to imitate these three categories is the very foundation of a quality working fly box. It is easy to get drawn into an endless array of fly patterns filling the bins of a well stocked fly shop, each fly pattern calling out its own special fish-catching allure. However, expert fly anglers know that simply a small collection of fly patterns always gets the job done. The reason only a few patterns are all that is really needed is that they imitate the three families of aquatic insects very well. I have selected a small handful of fly patterns that serve as a foundation to imitate the EPT families. The fly patterns are based on a general size and shape of each family with enough impressionistic qualities to possibly imitate more than one family by altering its size and color. Each season, I narrow down my collection of patterns based on general effectiveness. New patterns emerge from the vice that simply outperform old patterns from previous seasons. I noticed that if I focus more on impressionistic imitations with a focus on the EPT factor, the better my angling day. Good science has no need to reinvent the wheel. The wheel is already perfect in its intended purpose: to roll. The same holds true for many fly patterns invented long ago. There is no need to reinvent something that is already perfect for its intended purpose. However, like the wheel, we can alter it to suit our intended use without altering its core functionality. When choosing a small collection of fly patterns that function to imitate the EPT group, I look at the so-called "wheels" of fly design to select the tried and true patterns to serve as the foundation of a fly box. Having selected a core group of fly patterns I can then alter their size and color to imitate even more possibilities. In most cases I have stripped the original fly down to its most common element, to impressionistically imitate the basic shape, size and color. The following are my favorite patterns for each family, with a focus on patterns that can fall within multiple families. If a fly pattern can fall within multiple categories, it earns top spots in this collection. I am focusing on nymphs alone because the imitation of adults typically requires more exacting imitations rather than impressionistic fly patterns. I also spend 99% of my time searching the water with nymph patterns. Simplified Pheasant Tail Nymphs mimic mayfly nymphs very well and may even be taken for other food items. If we break down the shape of each of the EPT group, the single common denominator for all of them is a round, tubular shaped abdomen usually tapered at one end. In fact, beyond the EPT group, other families also have the same simple tubular shape. While many mayflies have different shaped abdomens, differing from torpedo to suction cup discs, if we blur our eyes for a second like artists do while painting, we would lose detail and a general shape of form emerges. In most cases, a simple tapered tube shape is the dominant form most frequently observed in benthic macro invertebrates. I have snorkeled many salmonid streams performing fish counts and identifications including benthic macro invertebrate sampling. I frequently see a behavioral pattern with fish holding in feeding positions within the stream channel. Fish will move from side to side and slightly upwards a few inches to take in any small object that has a cylindrical shape. Many times that object is just a broken twig or leaf stem that is then quickly ejected as a non edible object. The importance of this observation tells me that fish are prone to sampling anything that has a common cylindrical or torpedo shape common to most aquatic macro invertebrates. 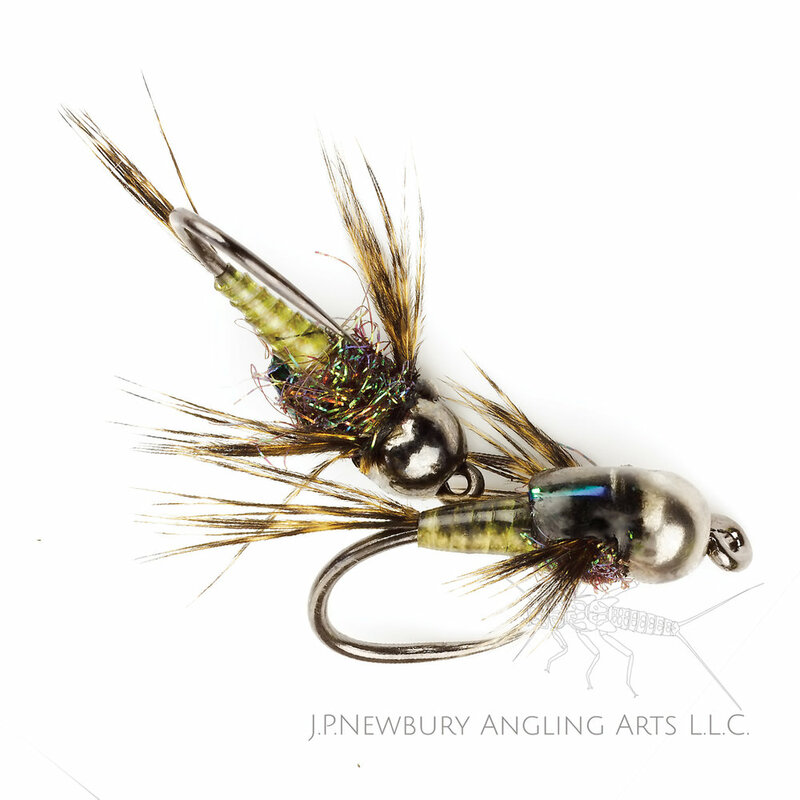 Most of my angling time is spent fishing in a general searching pattern, probing likely fish-holding locations with these attractor style nymph patterns. This is the time I use any of the general attractors that I have mentioned, patterns that have the general size and color of many of the insects commonly found in my river. It is only when fish key in on a specific insect at a specific moment in that insect's life cycle that I will then fish patterns designed to specifically imitate that instance.